WASHINGTON, DC, January 31, 2014 (ENS) – In its final environmental review of TransCanada’s proposed Keystone XL pipeline, the U.S. State Department today acknowledges for the first time that the pipeline could “significantly impact” climate change. 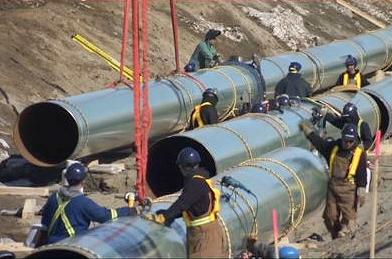 The Final Supplemental EIS is not a decision document on whether to approve or deny the proposed Keystone XL pipeline. Instead it is a technical assessment of the potential environmental impacts related to the proposed project. It responds to over 1.9 million public comments received since June 2012. The proposed Keystone XL project consists of a 1,639 mile (2,639 km) long pipeline to transport up to 830,000 barrels per day of heavy, tarry crude oil called bitumen, diluted with chemicals to make it flow, from the Canadian oil sands at Hardisty, Alberta. 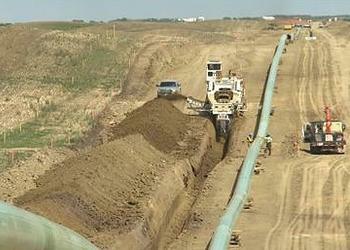 The pipeline would also carry crude oil from the Bakken Shale Formation in Montana. The U.S. portion of the route covers 875 miles from the Canada-U.S. border crossing near Morgan, Montana across three states to connect to existing pipeline facilities near Steele City, Nebraska for onward delivery to Cushing, Oklahoma and refineries on the Texas Gulf Coast. In earlier versions, the environmental review included the southern leg of the pipeline from Cushing to the Texas Gulf Coast. But since it does not cross an international border and so does not need a special permit from the U.S. President, TransCanada already has constructed that section and oil started flowing through it earlier this month. Because the pipeline crosses an international border, TransCanada needs a Presidential Permit before it can begin construction. The Presidential Permit review process focuses on whether the proposed project serves the national interest. In the FEIS, the State Department explains that greenhouse gas emissions from the entire lifecycle of the tar sands oil, from extraction through combustion, would be greater than the reference crudes by an estimated range of between 1.3 to 27.4 millions of metric tons of CO2 equivalent annually. The FEIS says this is equivalent to annual greenhouse gas emissions from burning fuels in 270,833 passenger vehicles, 64,935 homes or 0.4 coal-fired power plants at the low end of the range – to 5.7 million passenger vehicles, 1.36 million homes or 7.8 coal-fired power plants at the high end. Environmentalists who have been fighting the Keystone XL pipeline since TransCanada first proposed it in 2008 say these figures prove the validity of their opposition. “This is a very risky project with no reward for the American people,” Kenny Bruno, U.S. coordinator with the Tar Sands Campaign, told reporters on a conference call. 350.org co-founder Bill McKibben, said, “The intrusion of reality into this process is really important. The report concluded that in a scenario where we take climate change seriously and regulate climate pollution, this pipeline will indeed have a ‘significant impact’ on climate change. “So now we’ll find out if that’s the world Barack Obama and John Kerry want. This report gives President Obama everything he needs in order to block this project. This is the first environmental issue in years to bring Americans into the streets in big numbers, and now they’ll be there in ever greater numbers to make sure the President makes the right call,” said McKibben. Russ Girling, TransCanada’s president and chief executive officer, was pleased with the FEIS. “The environmental analysis of Keystone XL released today once again supports the science that this pipeline would have minimal impact on the environment,” he said. But those “thousands” of jobs are temporary construction jobs. If the pipeline is approved and built, only 35 permanent jobs would be created, earlier studies have shown. “Now the report concludes that Keystone XL will create the equivalent climate pollution of the exhaust of nearly six million cars each year, which the President cannot fail to recognize as significant and not in the nation’s best interest,” Brune said. 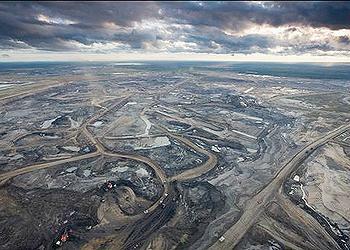 But there are other reasons for opposing Keystone XL. The nation’s largest organization of nurses today criticized the FEIS for paying inadequate attention to the serious consequences on public health. “There is broad concern about the harmful health effects linked to both the extraction and transport of tar sands, as well as how the pipeline will accelerate the steadily worsening erosion of health we see every day as a result of climate change,” said Jean Ross, RN, co-president of National Nurses United. “Nurses will continue to oppose construction of this project, and call on President Obama to stand with our patients and our communities, not the big oil interests, to reject KXL,” Ross said. Duncan Meisel of 350.org, which takes its name from the concentration of greenhouse gases in the atmosphere that most scientists agree is safe, said the release of the FEIS is the starting point for the next crucial phase of this fight. On the official level, a 30-day public comment period will begin with the publication of a Federal Register notice on February 5 and will close on March 7. During this period, the public and interested parties are encouraged to submit comments on the national interest to http://www.regulations.gov. Comments are not private and will be made public. During this time, the State Department will consult with at least, the eight agencies: the Departments of Defense, Justice, Interior, Commerce, Transportation, Energy, Homeland Security, and the Environmental Protection Agency. The Final Supplemental EIS and additional documents are available on the State Department’s website: www.keystonepipeline-xl.state.gov.